Located at the southernmost tip of the Baja peninsula, Cabo San Lucas and the Los Cabos region has quickly become a tourist mecca. With its variety of vacation towns (both isolated and lively), its wealth of activities, its rich local history and its affordable prices, it’s the ideal location for your next Mexican getaway. Los Cabos consists of four primary areas: East Cape, San Jose del Cabo, Cabo San Lucas and the Golden Corridor. Each area offers a completely different travel experience. The East Cape is bound to appeal to tourists looking for a rustic atmosphere and a sense of nostalgia. Located on the Sea of Cortez, it is comprised mostly of fishing villages. The area is renowned for its fishing, diving and snorkeling. With over 200 species of tropical fish and a variety of game fish, East Cape is truly a marine enthusiast’s paradise. One of East Cape’s greatest attractions is the Cabo Pulmo Marine Park, which contains the only live coral reefs in the Sea of Cortez. The Cape offers many more enchanting excursions for ocean lovers, including underwater caves, a massive sea lion colony, shipwrecks and miles of pristine beach. If it’s a romantic, small town experience you’re after, San Jose del Cabo is the place for you. This picturesque, charming town centers around an historic cathedral and plaza and offers a quiet experience of excellent gourmet dining and wines in a cozily intimate town with no bars or nightlife, none of the pressures or crowds of the city, and no pesky waits or schedules. While you visit San Jose del Cabo, be sure to visit the estuary where countless migratory birds set up homes amidst the unique vegetation the area offers. Without a doubt, Cabo San Lucas is he most famous and most active city of the Los Cabos area. Whether you enjoy water sports, beachcombing, shopping, fine dining or partying the night away with drinks and dance, Cabo San Lucas is bound to offer you the ideal vacation experience. Enjoy fishing, waterskiing, surfing, scuba diving or snorkeling? You’ll find it here. Taking a romantic stroll or enjoying lunch on the beach? That’s here too. Shopping for souvenirs, jewelry or art? No problem. One of the hottest bar scenes in Baja? Sure thing. Cabo San Lucas is a true travelers’ paradise with something for everyone. Finally, if you’re hoping for a luxurious and exclusive vacation experience complete with golf courses, excellent dining and elite resort hotels, the 20 mile long Tourist Corridor is your dream destination. Enjoy room service on your balcony while you enjoy a spectacular view of the ocean or the green. Savor gourmet meals from the finest on-site restaurants. The luxury hotels along the Golden Corridor offer privacy, relaxation and the best in service, with spas, salons, sports and nightlife. All this while enjoying the best architecture and amenities the area has to offer. 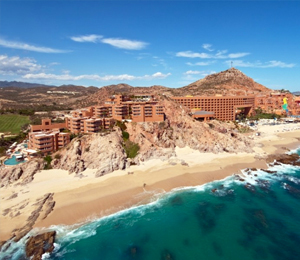 Whatever your travel style, Los Cabos has an area that is the perfect fit for you. And with prices lower than more traditional destinations, isn’t it worth giving this vacationers’ paradise a try?